The kittens are growing. Now they can hear and they are trying to walk. We tried to take individual pictures of them several times, but they protest and move a lot, so the pictures did not turn out that well. Here are some pictures we managed to take last Thursday, when they turned 2 weeks. 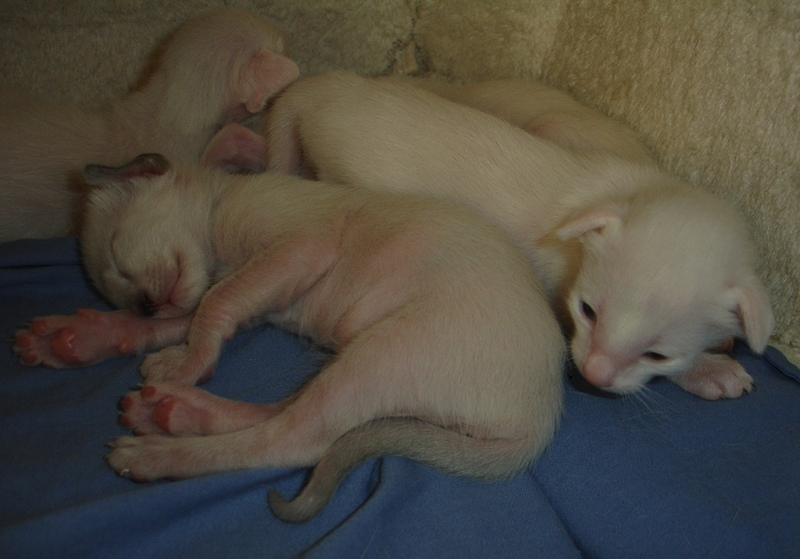 The kittens are very similar in their type and looks. 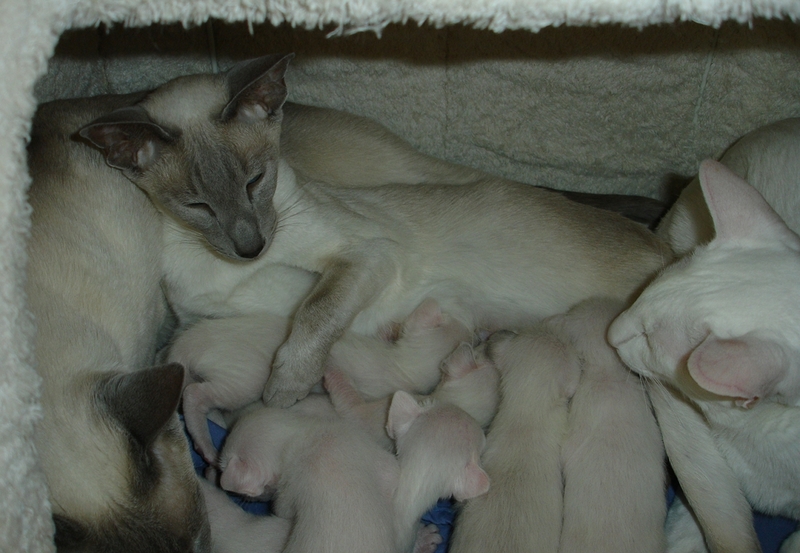 We believe that we have three Foreign White boys, one Foreign White girl, one blue point girl and one lilac point boy. Last week when we weighed them one evening (we weigh them twice a day), Albert ran into the kittens’ room, really worried because one kitten cried and protested loudly when I weighed it. He stopped thinking that they are scary small weird smelling creatures, and he started licking and comforting his small yelling sibling. Since then, he behaves exactly like Leroy – he is also the best nanny one could wish for. Jossan is so happy, she is just purring when both Leroy and Albert are with her and her kittens. Also, she goes out more often and leaves the guys to take care of them. We are so happy that we have so gentle and caring cats! Miii and Maven do not enter the tipi, but Miii guards the room. Maven is just curious. I know she licks them and cares for them when she can, but Jossan is not too happy about either her or Miii doing that at the moment, so they try to stay away from the small ones for now. They have really grown! Its pretty amazing that the mother allows the other adults into her tipi – very hippie indeed!